Pipes shedding stodgy image after decades of decline. camera (Courtesy George Lewis) Handsome hand made pipes by Richard Lewis, a Minneapolis pipe maker and seller. Pipe smoking had long gone the way of grandads' elbow patches, and when cigars surged in the 1990s, the pipe was most frequently seen as a prop to lampoon characters as tweedy or pompous. Sales are heating up, however, thanks to a young, digitally wired crowd that no longer see pipes as an embarrassing anachronism. It's a "slight upsurge," but it's also the first time in decades that the sales of pipes and pipe tobacco hasn't gone down, according to Jeff Moran, spokesman for the International Premium Cigar and Pipe Retailers Association. Moran's anecdotal assessment is backed up by store owners and pipe makers in college towns across the country. Moran can remember the hazy days of pipe smoking when fraternities, particularly those at Ivy League schools, were given free pipes and tobacco at the beginning of the school year to lure in new customers. That has changed. 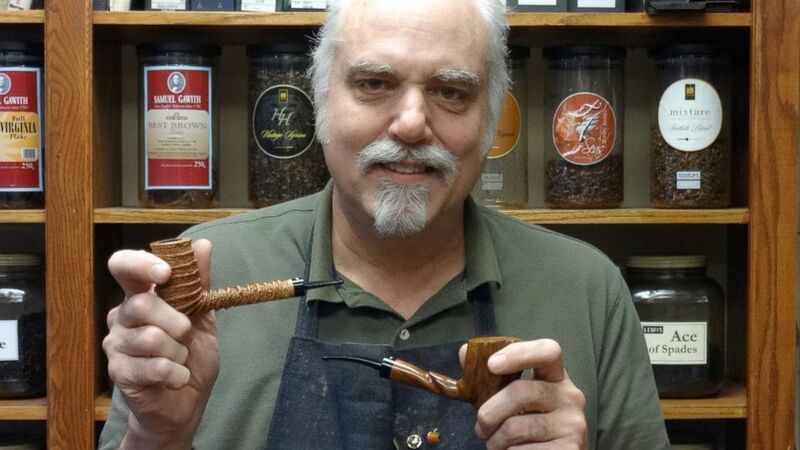 (Courtesy George Lewis) Richard Lewis with a display of hand crafted pipes at his Minneapolis tobacco shop. "Going back to the 1970s pipe smoking kind of got a negative image with younger people... In 'Animal House' the guy they wanted to project as putting on airs, they stuck a pipe in his mouth," Moran said. And when cigars boomed as a power accessory in the 1990s, pipes were unable to shed their stodgy image. Pipe smoking now seems to be riding the wave of microbrew beers, specialized coffees, and artisanal cheese. "Our customers aren't interested in Bud Light," said Pat Callahan of Jon's Pipe Shop in Champagne, Ill.
"It's a little hipper thing to do," said Rich Lewis who owns a pipe and cigar store in Minneapolis and makes his own pipes. The days of pipes being associated with the "snooty rich kid with the scarf around his neck is going away." Moran said the new smokers aren't buying "grandpa's cherry blend," but puffing on "some of the more high end tobaccos." "It's much like when certain people got into wines. They didn't start with screw tops and box wines. They seemed to get right into the more sophisticated wines," Moran said. 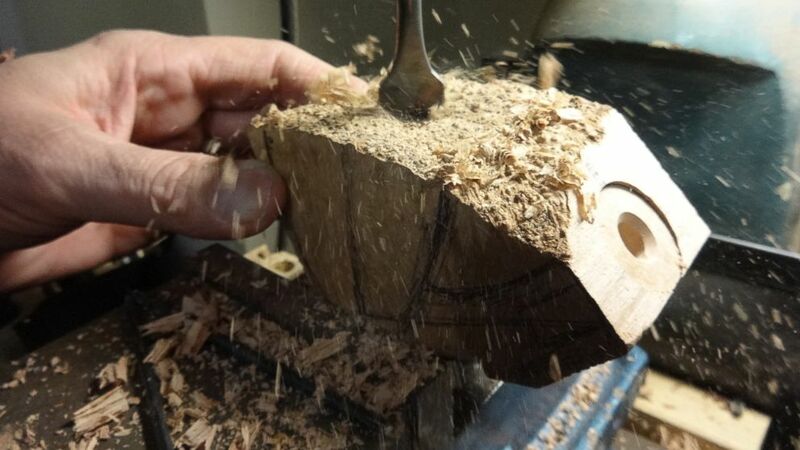 (Courtesy George Lewis) – Creating the bowl of a pipe in Richard Lewis’ Minneapolis shop. Callahan, who has been operating Jon's Pipe Shop for 40 years, said that before the 1970s, his business was probably 75 percent pipe tobacco and 25 percent cigars. That flipped during the 1990s, and today has leveled out 50-50, he said. The reasons for the resurgence vary. Moran suspects a growing popularity of hookah pipes has made tobacco pipes more acceptable. Others, however, feel it has more to do with good taste. "People are just interested in hand-made higher quality products," said Callahan, whose said his customers also seem to like fountain pens. Lewis said his customers range in age from 20 to 35 and appreciated this "niche stuff." "The pipes that I make pretty much sell as fast as I can make them," Lewis said. His own pipes sell for about $100 while others he purchases for resale go for around $60. Callahan's average pipes sell for $50 to $70, although he has others that sell for a couple hundred dollars. He also sells a couple dozen every year for more than $1,000. 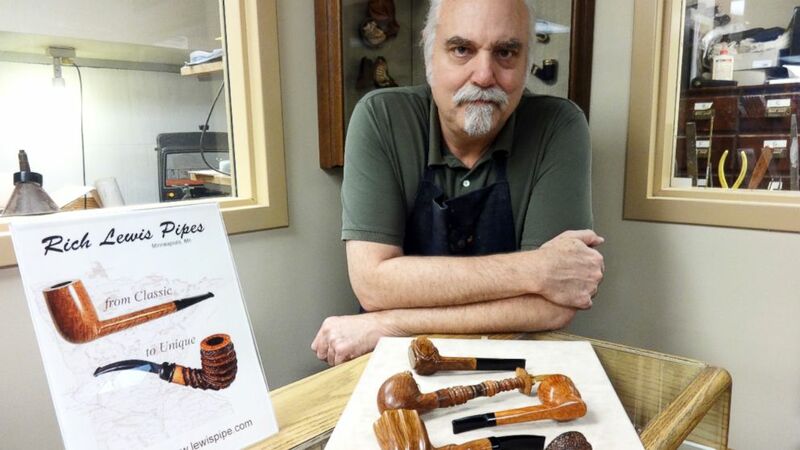 (Courtesy George Lewis) Minneapolis pipe maker Richard Lewis shows off two of the pipes he makes and sells at Lewis Pipe and Tobacco. 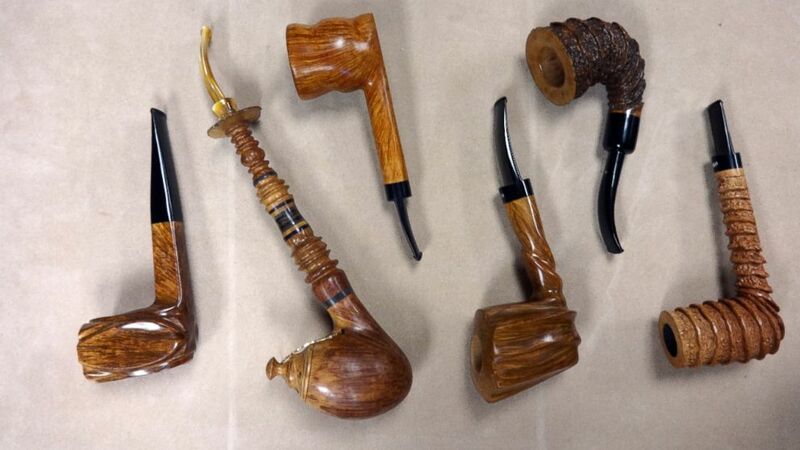 There is also a lively business in what is called estate pipes. "An estate pipe is a used pipe, reconditioned. Sounds much nicer, doesn't it?" said Callahan. Lewis has been called on to repair estate pipes that have then been sold for $6,000 to $10,000, and he has reconditioned pipes that have been sold to collectors for as much as $70,000, he said.